Discussions Magazine Music Blog: NEAL McCOY/Pride - A Tribute To Charley Pride: Available September 24, 2013! 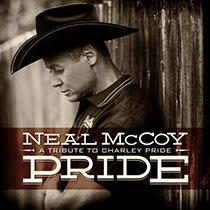 NEAL McCOY/Pride - A Tribute To Charley Pride: Available September 24, 2013! vocal stylists of classic Country music, but has never been saluted with a tribute album…until now. All three of the Pride hits that McCoy has been performing for years are included in his tribute album to the Hall of Famer. They are 1971’s “Kiss an Angel Good Morning,” 1970’s “Is Anybody Going to San Antone” and 1982’s “Mountain of Love.” They sit alongside eight other Charley Pride classics. present during the original recording sessions for some of the songs. McCoy wanted some guest artists on the tribute, so Fundis suggested Raul Malo and Darius Rucker. Backstage at a concert, McCoy approached Trace Adkins who became another enthusiastic participant on Pride - A Tribute to Charley Pride.